I love a good trash & treasure market. There's something inherently exciting about walking into a good car boot sale, where people are clearing out their unwanted things and selling them for bargain basement prices. Well, there's no reason to wait for fete season as the Rotary Club of Cheltenham are good enough to throw the gates open on the Cheltenham Trash & Treasure, Craft and Car Boot Sale market each and every Sunday morning for our treasure hunting pleasure. There's all the usual fare from general household items to plants, toys, tools and books. There are also food options on hand. But best of all, the market is fully sheltered. Nothing can rain on this parade. Come roasting heat or wintry rain, it won't make any difference at all. The market goes ahead regardless. The Cheltenham market is located in the car park at the rear of the Cheltenham Shopping Centre, corner Charman & Station Roads, Cheltenham. Enter the market site via Railway Road off Charman Road. 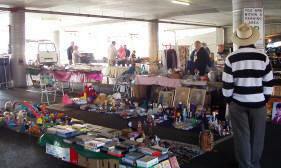 The market is open every Sunday from 8am to 1pm and is run by volunteers from the Rotary Club of Cheltenham. So all proceeds are used for both local and international Rotary projects. New stallholders are always welcome, and best of all stalls are only $10! Sell all your unwanted goods at rock bottom prices and still take home a wallet full of spending money to treat yourself to something nice. For more information, visit the Rotary Club of Cheltenham website by following the link here.